Improving log inventory is a key area where the New Zealand forestry industry could significant improve its supply chain performance. Although the process of counting logs seems relatively simple; in reality it is a difficult and labour intensive job. This is particularly significant to the New Zealand log export industry which is required to count and barcode every log (excluding pulp) that is exported. The fluctuating nature of export markets means that automated methods of counting logs hold significant potential. 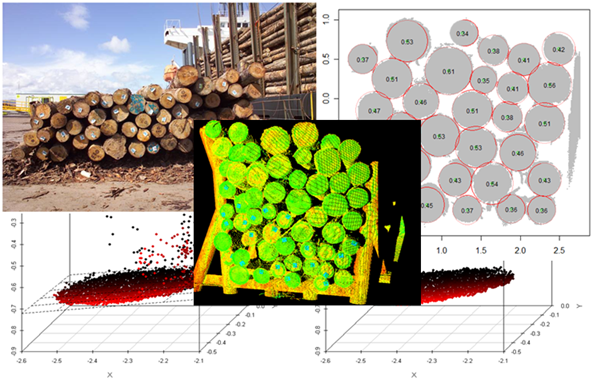 Hamish Marshall recently presented at the SilviLaser 2011 conference in Tasmania, looking at the accuracy of log counts for logs in pile/stacks using 3-dimensional (3D) point cloud data obtained from a ground based LiDAR scanner. In the past there have been a number of attempts to develop an automatic log counting system, the majority of these have used 2-dimensional photographic images. It was hypothesised that using 3D point data would overcome some of the problems that these approaches have encountered in the past. The validation study carried out on the algorithm showed that logs can be accurately counted and log diameters can be measured. Further work would be required to develop the algorithm into a commercial product and to determine the most cost effective hardware required to collect the 3-dimensional data required by the algorithm. SilviLaser 2011 brought together research scientists and practitioners from around the world to share their experience in the development and application of LiDAR for forest assessment and inventory and strengthen and develop new linkages between researchers, data providers and product end-users. This project was conducted through Interpine’s Research and Development division working alongside Scion Research and Future Forest Research.